TheWorkshop Physics Activity Guide is a set of student workbooks designed to serve as the foundation for a two-semester calculus-based introductory physics course. It consists of 28 units that interweave text materials with activities that include prediction, qualitative observation, explanation, equation derivation, mathematical modeling, quantitative experiments, and problem solving. Students use a powerful set of computer tools to record, display, and analyze data, as well as to develop mathematical models of physical phenomena. The design of many of the activities is based on the outcomes of physics education research.TheWorkshop Physics Activity Guide is supported by an Instructor's Website that: (1) describes the history and philosophy of the Workshop Physics Project; (2) provides advice on how to integrate the Guide into a variety of educational settings; (3) provides information on computer tools (hardware and software) and apparatus; and (4) includes suggested homework assignments for each unit. Log on to theWorkshop Physics Project website at http://physics.dickinson.edu/ Workshop Physics is a component of thePhysics Suite--a collection of materials created by a group of educational reformers known as theActivity Based Physics Group. 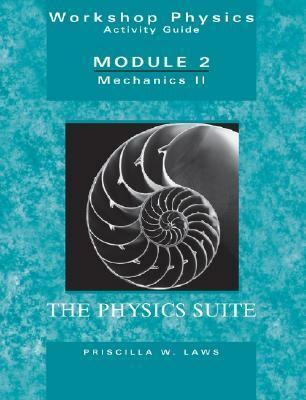 ThePhysics Suite contains a broad array of curricular materials that are based on physics education research, including: Understanding Physics, by Cummings, Laws, Redish and Cooney (an introductory textbook based on the best-selling text by Halliday/Resnick/Walker) RealTime Physics Laboratory Modules Physics byInquiry (intended for use in a workshop setting) Interactive Lecture Demonstration Tutorials in Introductory Physics Activity Based Tutorials (designed primarily for use in recitations)Laws, Priscilla W. is the author of 'Workshop Physics Activity Guide zModule 2 Mechanics II Momentum, Energy, Rotational and Harmonic Motion, and Chaos (Units 8-15)', published 2004 under ISBN 9780471641551 and ISBN 0471641553. Loading marketplace prices 6 copies from $31.92 How does the rental process work?